SAINT-DENIS, Sporting Alert – Starting lineups for the final Euro 2016 quarterfinal match between France and Iceland at Stade de France on Sunday. Teammate and star midfielder Dimitri Payet added: “We managed to score a lot of goals, we scored quickly compared to previous fixtures. Iceland captain Aron Gunnarsson said: “We are disappointed but incredibly proud. It’s been an amazing experience. A lot of hard work has gone into this and the fans have been fantastic. “[Speaking after the final whistle] They are still singing, it’s unbelievable. The French have all left. They are still here. It just shows what we put into this. 7 – France v Iceland is the first EURO game with 7 goals since Netherlands v. Yugoslavia (6-1) in 2000. Prolific. Iceland keeps fighting and has been rewarded with another goal though Birkir Bjarnason. France leads Iceland 5-2. France running away with this game and it’s Arsenal forward Olivier Giroud, who latched onto Dimitri Payet’s free kick to head home for his second goal of the match. France leads Iceland 5-1. Kolbeinn Sigthorsson find the back of the net for Iceland and they are not giving up. France leads Iceland 4-1. 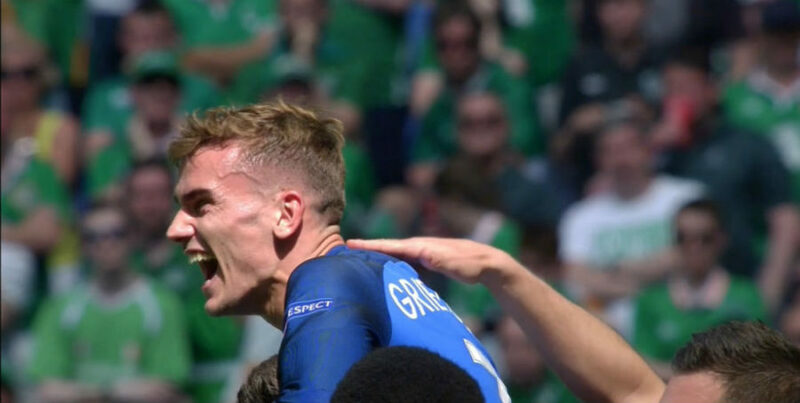 Antoine Griezmann grabs another goal for France with a neat-looking chip over the keeper. France leads Iceland 4-0. Dimitri Payet drilled a low left shot into the corner of the net to knock the wind out of Iceland. France leads 3-0. Iceland is in trouble right now, as Paul Pogba, who hasn’t scored for his country in almost two years, out-jumped his marker to add another goal for France. France leads Iceland 2-0. The Arsenal forward has given the host country the perfect start to this quarterfinal, timing his run well to latch onto a through ball and beat the goalkeeper. France leads Iceland 1-0. 9 – Olivier Giroud has scored nine goals in his last nine starts for #FRA. Instinct. “I think Ronaldo would only swap shirts with himself if he could” – Taylor Twellman. France make two changes to the starting side from the last game for today battle. Following the suspensions of Adil Rami and N’Golo Kante, Samuel Umtiti and Moussa Sissoko have been drafted into the starting XI to play at centre-back and in midfield. With Sissoko coming into the side, it should all France to play a little more freely, since Blaise Matuidi will be the only holding midfielder in the team. Expect to see both Antoine Griezmann and Dimitri Payet roaming a lot more, which should create more chances for striker Olivier Giroud. Meanwhile, Iceland named the same starting XI for the fifth game in a row at Euro 2016, as they seek to shock the hosts, the same way they did against England. The host nation has not been consistent in the tournament, and Iceland will certainly be backing themselves to create an upset in the Paris suburb of Saint-Denis. Iceland: Hannes Halldorsson, Birkir Saevarsson, Kari Arnason, Ragnar Sigurdsson, Ari Skulason, Johann Gudmundsson, Aron Gunnarsson, Gylfi Sigurdsson, Birkir Bjarnason, Kolbeinn Sigthorsson, Jon Dadi Bodvarsson.